What’s the difference between my good friends and the Orioles’ bullpen? One by one the Oriole relievers came out to the mound. One by one, they gave up runs. Tying runs, go ahead runs, tying runs, go ahead runs. Finally, with the game tied in the ninth, Darren O’Day, the trusty sidearmer, came out, threw one ball – just one lousy pitch. Emphasis on lousy. Homerun. Game over. Oh sure, we all have bad days. But, I’m grateful that I don’t have thousands of people peering over my shoulder, second-guessing, and jeering when I have mine. It’s a gift, I think, to endure a bad day in the shadows … where no one can see you sulk. The Orioles weren’t the only team with a leaky bullpen last night. By the end of the night, there were three blown saves recorded in that game. THREE. And, only one belonged to the Orioles. The Diamondbacks won, despite two blown saves from their relievers. So, a bad night to be a reliever. Baseball fans say that a lot. But, instead of jeering and heckling and second-guessing, I’m here to praise the bullpen. The Orioles bullpen. Every bullpen. Next to Umpires, the most thankless job in baseball. It’s where starting pitchers are punished. A few bad outings, a few hinky pitches, and a starting pitcher is banished to the ‘pen. One is seldom “promoted” to the bullpen. It’s where mascots are crammed together, squeezed in tight with the relievers, as they await a race around the warning track. 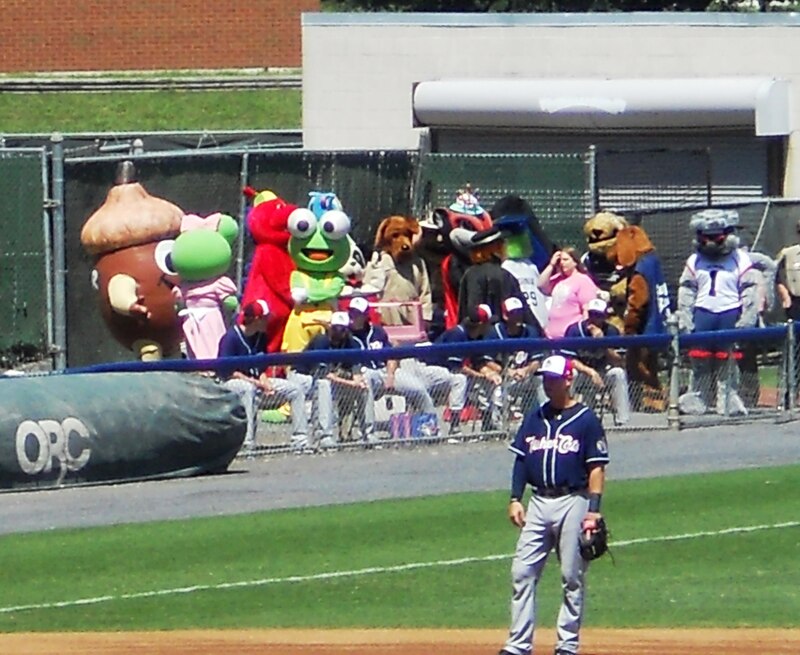 If you look carefully, you can make out the AA New Hampshire Fisher Cat relievers in the bullpen trying to ignore all the mascots. It’s where Minnesota Twins’ relievers spend a year patiently waiting for that one brief perfect moment to prank the cameras. Oh, come on I know you want to watch … here. It’s where pitchers catch homeruns in their caps. A’s Reliever Sean Doolittle’s Twitter Bio says this: I get to play baseball with my friends for a living and sometimes they even let me be pitcher for an inning! It’s where no one ever gets to be hero and everyone is the goat eventually. They will be booed and heckled. Mercilessly. By the time they come into the game, your nastiest hecklers are already well into their cups … many, many beers to the wind. The more beer, the louder and stupider the heckle. It’s a fact. When bullpen pitchers succeed, when they hold the lead, you won’t hear a word. The batters will be rewarded for scoring plenty of runs. The starting pitcher will be lauded for not letting a game get away. The bullpen? Hey, they were just doing their job. Remember Jay? My new favorite thing to do is bounce ideas off of him. So, Jay, what do you have to say about relievers? It is the nature of the role that relief pitchers make you nervous. The term “relief” implies you aren’t the real thing — you are on standby in case something happens – i.e., a relief valve. That is why relief pitchers got no respect at all until they invented euphemisms to class them up — thus, the “closer” – sounds important; “set-up guy” – sounds tricky; “long man” – actually sounds superfluous, but you get the idea. A position player can strike out once or twice in a game. But, as soon as he does this … all is forgiven. Bullpen pitchers don’t have the luxury of a shaky first. So, the Orioles bullpen had a bad night. But, they’ve had plenty more good nights. So, yay, for the bullpen. And, for every reliever who has had a bad game … or blown a save (or two or seven). Rest up, guys, because we’ll need you to be ready to try again for us tomorrow. This entry was posted in Baltimore Orioles, Baseball and tagged bullpens, Chris Davis, mascots, Minnesota Twins, Minor Leagues, Oakland A's, Richmond Flying Squirrels by Jackie, The Baseball Bloggess. Bookmark the permalink. That fake punch was classic and typical bullpen pitcher behavior! My now 2 year old went to his first ever game last year and we had front row seats in our section that overlooked the Cardinals bullpen. It was great to shoot the breeze with Yadi before the game and get tossed a ball by Murphy, the lovable bullpen catcher after warming up one of the pitchers. At some point, my boy chucked his little foam bat into the pen several feet below where it stayed until one of the relievers was kind enough to come toss it back to my little guy. It looks like a lot of fun working in those bullpens, if you ask me, but as you know, no chick says she hopes to hook up with one of the middle relievers. Lol. LOVE LOVE LOVE your blog and your kids are great! Great photos. I still blame Scharaldi (not Buckner) for 1986. Thankless, yes; merciless, even more so. On the subject of Bob Lemon, he was shown on “Woodie’s World” on ESPN Classic Wednesday morning, managing a minor league club at Sacramento’s Hughes Field. Like the LA Coliseum, it was a football field with a baseball diamond and a left-field fence 233 feet from home plate. Lemon, in the third-base coaching box, was shaking hands with home run hitters “as frequently as a politician outside a factory,” quipped Haywood Hale Braun. Later, there was a piece on uniforms, at one point showing a Dodger player in a SATIN uniform. You can understand why it didn’t catch on. It’s really a treat to catch an hour with Woody Wednesdays at 7 a.m. EDT on ESPN Classic.